Tulsi (left) and Shyam Ramsay with one of their monsters during the production of ‘Dahshat’. None of the brothers actually admit to having butterflies in the stomach when Do Gaz Zameen Ke Neeche was released (in 1972), an ‘A’ certificate giving it a sort of illegitimacy—and ‘B’-grade status—straightaway, making sure that a large chunk of the general audience was not going to give it a second chance. The family audience, as the industry calls it, was not going to watch Do Gaz Zameen Ke Neeche at all, as they wouldn’t most of the Ramsays’ later films either. “We knew that," says Tulsi Ramsay (the third of the seven Ramsay brothers ). “We had made a low-budget film and we knew that only some young boys and girls would come to watch it. You know, they will get a bit scared, they will cuddle a bit, thoda darr, thoda romance (a little fright, a little romance)." Sriram Raghavan, the director of Johnny Gaddaar (2007) and Badlapur (2015), was one of that darr–romance brigade. “One new movie would release every seven-eight months; I thought of them as clutter breakers. They had a dedicated audience already. The fun I had when the Ramsay movies came! My first date—I took a girl out for a date, and we went to watch Guest House (1980) in Alankar theatre in Pune. The chills, the thrills, the girls, shadows in the dark. It was great fun and great value for money." ‘India’s first horror movie,’ screamed the posters. The film released in 20-30 theatres in Bombay. The details are a bit fuzzy after all these years. But that it made around Rs50 lakh in profits is fresh in the brothers’ memory. “People said that Hitchcock’s brother had come to India to make a film," Arjun (the fourth of the brothers) laughs. “It was a good film, it came out well, yes," Gangu (the second of the brothers) says, going quiet for a while. Then he asks me how old I am. I tell him. “So you were not even born when Do Gaz Zameen Ke Neeche came out. You must have grown up seeing such slick films, all show-shaa. But at that time, remember this was 1972, no one had seen a film like this." He was right. It was a hit. The “magnificent seven” Ramsay brothers with their father, Fatehchand Ramsay. A small budget, no stars, and an ‘A’ rating—despite all that, the film worked. Only a few theatres in Bombay and New Delhi screened it, mainly in the 10am and 9pm slots. But, by the end of the first week, Do Gaz Zameen Ke Neeche was making steady money. “All shows were full," Tulsi says. “Friday, Saturday, Sunday… weekdays also. We went to the theatres in Bombay quietly, and the public was screaming. They loved it. Shyamu (Shyam, the sixth of the brothers) was in Delhi, and he called me to say that we shouldn’t sell the rights of the film to anyone, whoever it might be. We should hold on to everything." While the initial promotions were only on radio, soon the distributors wanted more. The brothers remember large posters going out in Bombay and New Delhi. More territories, not just in the metropolises, were signed up. Tulsi produces a Times Of India report, which says that a 30-minute promo—the audio track of the film, accompanied by a commentary by Sheel Kumar Sharma of Yeh Vividh Bharati hai fame—was aired on All India Radio late at night. Tulsi remembers the promo well. “He said it was a Ramsay brothers film, and asked people to go to the theatre and watch it. He called it India’s first horror film; people should keep their doors and windows closed. He would say it in a deep voice, and when he stopped, there would be Anjili’s (played by Shobhna) scream. There were dialogues and songs, interspersed by Sheel Kumar’s voice. It got people talking. There was a lot of buzz around the film." He still has a shorter recording of the advertisement. He plays it for me, after telling me what’s in it. I know Anjili will scream sooner or later. I hang on to every word Mr Sharma says. And then the scream comes, exactly when I know it will, because Tulsi has told me. But I still react with a start. This is in 2015. In an upmarket apartment in Mumbai’s Lokhandwala (Tulsi’s house). I imagine the effect, without all of the warnings that Tulsi has sent my way, in 1972. “Small film, big hit; we still get royalty from it," Tulsi says. In his paper ‘Fear on Film: The Ramsay brothers And Bombay’s Horror Cinema’, Kartik Nair writes, “In many ways, the impact of (the Ramsays’) films was primarily disruptive, a series of spectacular challenges for the industry, the press and the audience." What that automatically did was create divisions within the industry—when I say industry, I mean all stakeholders: film-makers, technicians, actors, journalists, distributors, etc. It would have been fantastic to have been around, somewhere within earshot, in 1972 when Do Gaz Zameen Ke Neeche was released. Here we all were, maintaining status quo, moving from Rajesh Khanna to Amitabh Bachchan and eyeing Saeed Mirza with great suspicion, and, out of nowhere, came this errant force. A mishmash of Hammer and the Hollywood slasher films of the 1970s and Mario Bava, the director of thrillers in Italy through 1943 to 1979. Adding elements of the supernatural and of superstition, and much else a mainstream Hindi film-maker—forget a Mrinal Sen or a Shyam Benegal—would not even scoff or smirk at, the Ramsays created their own formula for disruption. That was incidental, of course; their objective was to do good business. But challenging the status quo was a major side effect of the Ramsays’ work. Nowhere was this division as palpable as in two issues of Filmfare: the first, 1-16 January 1985, and the second, 1-15 August 1985, have two writers providing two very divergent views on Purana Mandir and, with that, on the films of the Ramsays. The first is by film producer and writer Pritish Nandy, titled “Indiana Jones Returns to the Temple of Gloom", and the second is by film-writer Roscoe Mendonza, titled “Love at First Bite". As the headlines suggest, Nandy hated everything about the film and the film-makers and found it spoof-worthy at best, while Mendonza’s is a far more nuanced and affectionate take. The articles came about, possibly, because of the overwhelming success of Purana Mandir. Filmfare had thus far largely avoided acknowledging the Ramsay movies. It didn’t fall within their ambit. And that was understandable. But a Ramsay wave, a horror wave, was sailing through the industry, and the premier film magazine needed to take note. Nandy didn’t even make a passing reference to the fact that Purana Mandir was a success, and, if anything, said the opposite: “Everyone wants the gate money back, while the ushers hide under the chairs." Really? His article is as disparaging as it could possibly be, and sarcastic too: “One cannot help admiring the sensitivity and intelligence with which this film has been made. It speaks volumes for Hindi cinema and the Ramsays, our horror movie moghuls (sic), who have (with this film) graduated towards serious, thought-provoking cinema of a kind rarely seen before." Mendonza propped up Purana Mandir up as the second-highest grosser of 1984. Was it a rebuttal? Did public sentiment compel the editors? In any case, Mendonza’s article more than made up for Nandy’s prejudice, although he appears to have gone a little too far in the other direction: “It is not jingoism that makes me crow that Hitch (Alfred Hitchcock), with all his 53 films, could not manage what our Ramsays have done with their ten movies." He says the Ramsays—whom he calls Magnificent Seven—did more with horror than Bram Stoker, Mary Shelley and Edgar Allan Poe combined. “It may be fine for Mrinal Sen or Saeed Mirza to trumpet the ways and means in which their movies serve the needs to society. Likewise, the dukes of commercial cinema who tout the need for entertainment in a weary society. But can either of these two cliques bring to their film-making a true understanding of the Indian psyche the way Ramsay brothers have?" Overboard? Certainly. But after ignoring the Ramsays for long and then the uncharitable piece from Nandy, “Love at First Bite" was just the overcompensation the magazine needed. And the Ramsays too. It was their mainstreaming—and, after Purana Mandir, there was no way to refuse them that space. “The industry ill-treated the Ramsays, that’s for sure," says Aarti Gupta (an actor in several Ramsay productions). “They were typecast. People made the worst jokes about them. Calling them monsters. People would say Tulsi-ji looked like a monster and that they spoke with ghosts at home. The industry was very, very mean. But they had the last laugh, didn’t they? I have told everyone this story—the Ramsays were good people. I’ll give you an example. At that time, the casting couch was 100 per cent there. They went around telling everyone what a good girl I was. For no reason. They told everyone that Aarti, she won’t bother even with the biggest star. She is the most decent person in the world. When Purana Mandir became such a big hit, however, no one could ignore them even if they wanted to." 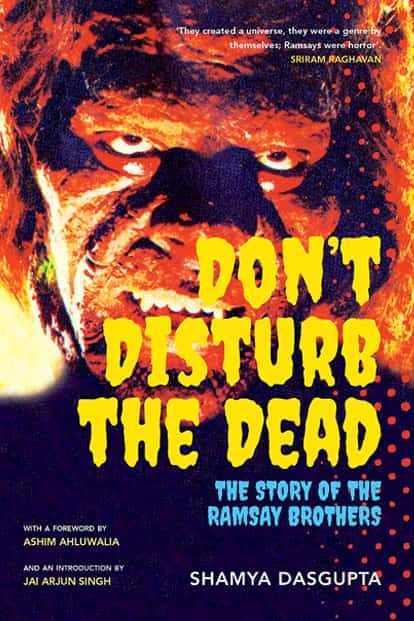 The cover of ‘Don’t Disturb the Dead: The Story Of The Ramsay Brothers’. Speaking to Gupta, so much an industry insider, is a revelation. In part because she is forthright. And though she gets the seven brothers mixed up at times, she remembers the details like it were all just yesterday. “They [the film magazines] all wrote us down. They called me names—Shobhaa De (then editor of Stardust) named me the “Ramsay girl" or “Ramsay heroine", not using my name; it typecast me and harmed my career quite a bit. “The press was vicious; people like Shobhaa De were vicious," Gupta says. The hurt, even after so many years, comes through. Turn to the Ramsays, though, and the negative press seems to have passed them by; it’s almost as if they were looking the other way and missed it all. There is a degree of resentment that shows through once in a while but, by and large, they put up a stoic indifference to it all. Really? Oh, is it? I didn’t know. 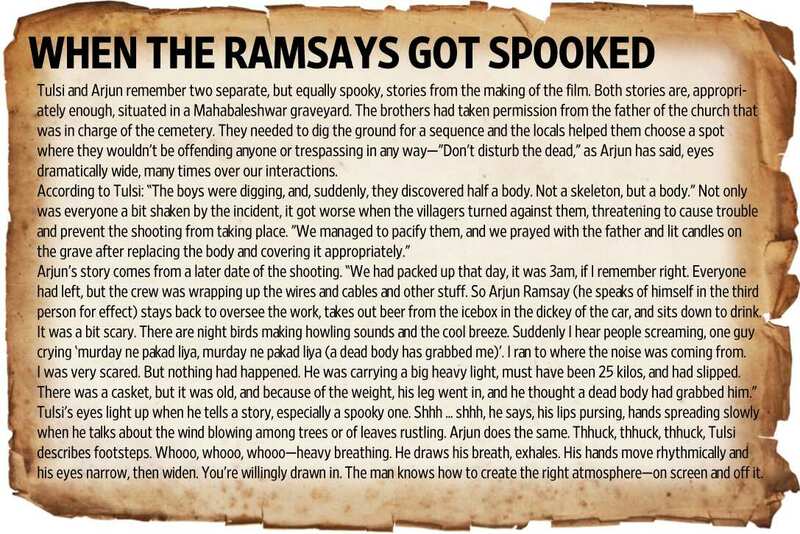 Edited excerpts from Don’t Disturb The Dead: The Story Of The Ramsay Brothers, forthcoming from HarperCollins India in May.